The house called Preswylfa was used by the Midland Bank as its local branch – but only one day each week! The cashier would arrive in the village with a security guard, who was usually of pensionable age. Customers would ring a bell and be shown to the front room, doubling up as the cashier’s office. The water was pumped from a spring known as Ffynnon Asa (“Asa’s Well”). Before the 1860s, villagers had to walk from the well with their filled pails. The pump was rediscovered and placed on public display in the village cemetery in 2015. 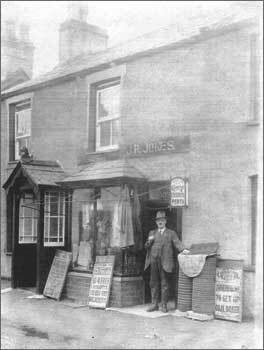 To the left of Preswylfa is Stanley House, once a shop which sold daily newspapers, including the North Wales News and Visitors’ Chronicle, Y Faner and Y Genedl Gymreig. In the early 20th century the most popular title here was the Daily Herald, a left-wing paper which opposed the First World War.